The Calix C7 is your go-to multiservice access system when you have an application that requires TDM services. This system is built with remote terminal and central office (data center) deployments thanks to a unique ability to integrate support for TDM and SONET services such as DS0, DS1, DS3, T1 and voice gateway. The Calix-Occam C7 shelf uses a single chassis for all control and service plug-in cards as well as your management interfaces. The unit includes 23 system slots, 20 of which are universal and can host a variety of electrical and optical plug-in cards. 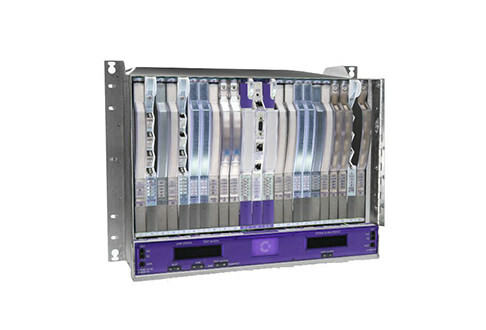 The backplane of a Calix-Occam C7 delivers up to 10 Gbps of full duplex user bandwidth to every slot, simultaneously, exceeding 200 Gbps in total. You’ll also get 10 Gbps delivered to a redundant central switch to protect your network and service delivery. In 2010, new and refurbished Calix-Occam C7 units got support for EXA powered line cards to enable up to 10 Gbps Ethernet Transport, VSDL2 and GPON services as well as increased support for gateway functionality specifically for video services from providers. The new line cards use the Calix Ethernet eXtensible Architecture that uses industry standard protocols and kernels for network access and higher bandwidth support on both fiber and copper. It’s a smart addition to help used Calix-Occam C7 work better across legacy networks. Combined with existing high-density interfaces, switch capabilities, remote alarms and maintenance support, a used Calix-Occam C7 could be a smart and affordable investment for your network when you select one from Worldwide Supply.